AluredPopple is a Legacy Library. Legacy libraries are the personal libraries of famous readers, entered by LibraryThing members from the Legacy Libraries group. » Alured Popple's legacy profile. AluredPopple is also an author. About meAlured Popple (1699 - 17 November 1744), English civil servant and Governor of Bermuda. The Popples were a well-connected English family: Alured's great-grandmother, Mary Marvell, was a sister of the poet Andrew Marvell. Mary married Edmund Popple, Sheriff of Hull. Their son William was a correspondent of Marvell's and developed a friendship with John Locke, whose Letter on Toleration he translated into English. Alured's brother William (1700/1-1764) published verses, plays, satires, and translations (including one of Horace's Ars Poetica published in 1753). He was also the co-author (with Aaron Hill) of The Prompter, a dramatic periodical published 1734-1736. Unpublished translations and stage adaptations by Popple are at the British Library and the Bodleian. Alured Popple held a clerkship at the Board of Trade during his early years, and in 1722 was appointed secretary to the Board, a post held by his grandfather and father before him (William from 1696-1707, William Jr. from 1707-1722). Alured held the post until 1737, when he relinquished it to his brother William. During his tenure he implemented a system of fees for the services carried out by the office, replacing the system of informal graft that had developed. He was known for his "great knowledge and capacity of governining." In 1737 Popple was appointed lieutenant-governor of Bermuda, and a year later he acceded to the governorship, replacing Captain John Pitt. Upon his arrival in Bermuda, Popple wrote back to London "Notwithstanding the information I had in the Plantation Office, Bermuda never appeared to me to be of such consequence as I now find it to be." During his governorship, Popple worked to increase Bermuda's fortifications, supported various agricultural experiments, tried to unknot certain difficulties with the island's currency system, and generally attempted to bring order to Bermuda's political climate. Popple was housed in the third "government house" in St. George (which stood on what is now the site of the Unfinished Church). 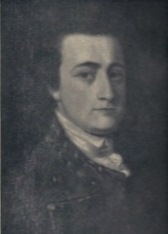 At some point during his tenure the house leaked; as Henry Wilkinson put it, "when the roof leaked over Alured Popple so that he had to rent a dwelling in the town to save his books and portraits, St. Georgians felt the humiliation so keenly and expressed it so tenderly that His Excellency in turn was touched by their solicitude and spurred to hasten his return to 'government house,' as it was then called." In the meantime Popple stayed at Bridge House (which still stands today and is owned by the Bermuda National Trust). Popple introduced Freemasonry to Bermuda, being appointed Provincial Grand Master of the Bermudas or Somer's Islands under a patent granted by Lord Strathmore. Popple's brother William (who replaced him as governor at his death) was granted the same position. Popple died of a "bilious fever" on 17 November 1744, after an illness of nine days. His elegant grave marker is mounted inside St. Peter's Church, in St. George. About my libraryPopple's extensive library is described at length in Henry Wilkinson's Bermuda in the Old Empire: "Alured's library of more than a thousand volumes, starting with the Latin classics and then the Greek in translation, traversed all the standard poetry, prose, and drama not only of England but of France, with an ample supply of biography, history, law both civil and ecclesiastical, theology, medicine, commerce, fortifications, natural science, pure science, and pseudo-science including the veterinarians' and farriers'. There was nearly everything from rhetoric, through six volumes of Pills to Purge Melancholy, to shorthand, and the collection included, ... Captain John Smith's History of Virginia, Oldmixon's History of the British Empire, several volumes on the buccaneers, Dampier's Voyages, Gulliver's Travels and Robinson Crusoe. It is doubtful if any colonial administrator ever took a better selection of books with him ..." (pg. 294). Aside from the examples given, Popple's library includes some very significant works, including titles by Galileo and Newton. See the tag cloud for a general sense of this wide-ranging collection. Among the other scientific items in Popple's study were "A Pair of Globes," "A Camera Obscura," "A Microscope," "An Universal perpetual Mathem[atical] Instrum[ent]" and various navigational tools. In the inventory of Popple's estate taken after his death, the library is appraised at £175/1/3, a sizeable percentage of the entire estate (valued at £761/5/5). The list of books consumes seven of the ten pages of the inventory (Bermuda Book of Wills, Vol. 8, pp. 19-28). Just what happened to his books is not entirely clear, and is still being studied. The books are included here along with the relevant entry as given in the inventory and their appraised value. Tags have been added.